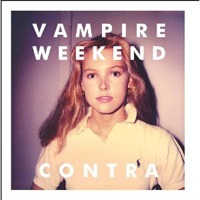 Vampire Weekend follow-up their breakthrough 2007 debut with Contra, which has already been a tremendous hit. And from hearing this effort from the New York quartet/Ivy Leaguers, you can understand why: it blends their distinct world music sound with catchy melodies, clever artsy lyrics, and electronic soundscapes and intricate production. Nearly every track is exuberant and charming from “Horchata” (taking its name after a Latin American beverage) to the quirky and rocking “Holiday” to the danceable “Run” and “Giving Up the Gun.” Even the band again touches a bit of classical with “Taxi Cab.” Only “Cousins” deviates from the world music sound coming very close to punk rock and being the heaviest song on the record, and the ballad “I Think UR A Contra” closes out the album as a musical mixture of everything. Contra maybe a little more musically ambitious and bolder compared to the debut. That’s what probably makes this sophomore album Vampire’s most interesting and satisfying offering.